The new Museum at the Gateway Arch will open on July 3, 2018! Join us at the new West Entrance for a ribbon cutting ceremony at 10 am. Following the ribbon cutting, the museum and will be open to the public! There will be a celebration in the North Gateway park area after the ceremony with food trucks, games, live music and more! 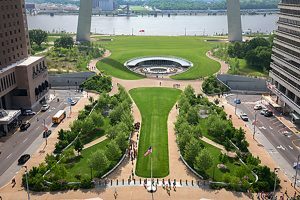 For more details and updates, please visit the Gateway Arch Park Foundation website. Gateway Arch Hours of Operation: Please note Gateway Arch hours of operation the week of July 2 (the last tram departs approximately one hour before closing time). Monday, July 2: 8 a.m.-5 p.m.
Tuesday, July 3: 12-10 p.m.
Wednesday, July 4: 8 a.m.-8 p.m.
Thursday, July 5: 8 a.m.-10 p.m.
Friday, July 6: 8 a.m.-8 p.m.
Saturday, July 7: 8 a.m.-8 p.m.